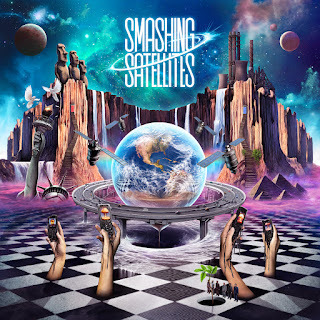 All-Canadian band Smashing Satellites was the brainchild of Salvatore Costa, after years of being in a band that wasn't his he wanted to sell out arenas being the frontman of his own band. Well good news - his dream finally came true. Their self-titled debut album was released earlier this year, with help from the producers of the most legendary and well-known songs and artists in the business (Alice Cooper and Shinedown to name a few). The album opens with 'Waterfall', a very guitar-heavy song with lyrics about going crazy and "drowning in tears", reminiscent of lyrics written by artists such as Pop Evil - a good, meaningful metaphor to everyone in some way. Lead single 'What It's All About" tells the listener to let go of your insecurities and see the light at the end of the tunnel, something not normally spoken about without it being in a really cheesy pop song. Speaking of which, 'Calm Me Down' sounds like a Pop song in the first few verses, but becomes more of a ballad in the chorus, a blessed relief from all the heaviness of the other songs. Another ballad on the record is the rather sweet song 'Love Is Forever', explaining all that he feels about love and how a relationship he's had will forever last. There's also a stripped back acoustic version of 'Like A Feather' featuring just Costa's surprisingly soulful voice and a guitar. For their debut album, Smashing Satellites are onto a winner, finding their great sound so early and with Costa being an already experienced musician, are soon going to be up there with the leading bands of the genre. You can check out SonicAluzion and buy it on iTunes here. Also check them out on Facebook, Twitter and Instagram to see where they're going to be touring and what they're releasing next. Don't forget to follow me on Bloglovin', Like my page on Facebook and follow me on Twitter and Instagram to see what my newest review will be, posted every Monday at 3pm GMT.